If you don’t get enough exercise there’s a good chance you’ll be expiring long before the rest of us – and you don’t want that, do you? A combination of time, effort, gym fees and fleeting bouts of amotivational syndrome is often enough to put an end to many exercise regimes, but it doesn’t have to be an uphill struggle. 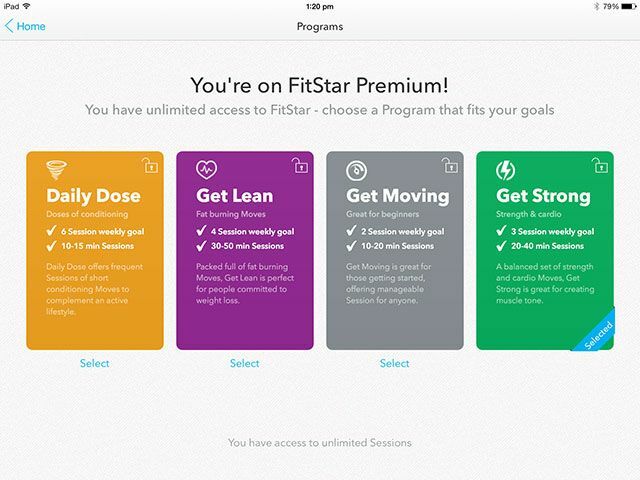 Previously iPad-only, but now iPhone-friendly, Fitstar is a free iOS app designed to train you in your own time. The app uses your available environment rather than expensive equipment – if you can lie on the floor outstretched, you’ve got enough room. There’s a limited free program, and a monthly subscription thereafter if you’re really serious about getting fit. I’ve been using Fitstar for a few weeks now, and here’s what I’ve found so far. Fitstar uses a personal trainer to get you motivated, because there’s nothing like the human touch when it comes to motivation. This trainer takes the form of NFL and all-round fitness star Tony Gonzalez who, despite being built like a brick outhouse, serves his purpose well and makes the whole “exercise on your own” thing feel a lot less lonely. Before you embark on your fitness journey, the app will quiz you about your current regimen, level of fitness and invite you to input vitals such as height, weight and age. Once you’ve done this, you’ll need to take a fitness test which lasts somewhere around 7 minutes. Daily Dose: For an already active lifestyle, uses six sessions per week lasting between 10-15 minutes. Get Lean: Designed to burn fat over four sessions a week, with longer 30-50 minute sessions. Get Moving: Two sessions per week at 10-20 minutes, ideal for beginners and those looking for something manageable. Get Strong: A balanced program split between burning fat and building muscle, with 3 sessions per week at 20-40 minutes each. These programs require a premium membership, and so you will need to subscribe in order to access them. After completing my own test, the app recommended I went on the Get Strong program, advice which I took. I was able to tell the app that I was woefully unfit, and to essentially “go easy” on me – so far, so good, but you’ll still work up a decent sweat. Each session comprises of a number of exercises, preceded by a 20-second break in between each activity. This gives you a small amount of time to recover, but more importantly it gives you a chance to study the next exercise so that you know exactly what you’re doing. Every three or four exercises is punctuated with a whole minute of rest, something you’ll definitely appreciate to begin with. 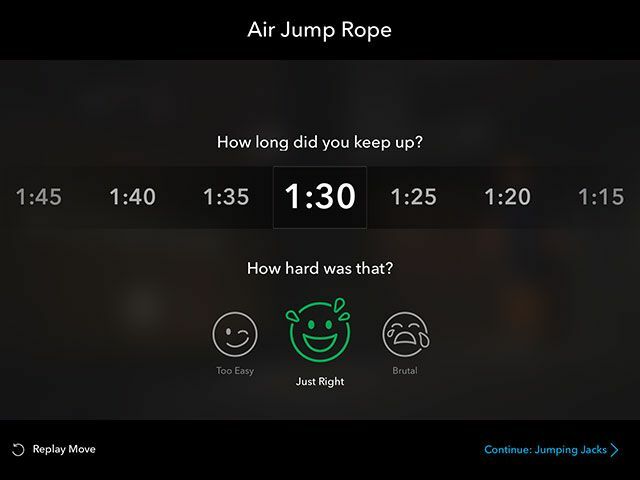 After each exercise you’ll be asked to input the time you kept up or total number of reps completed, in addition to whether you felt the exercise was too easy, just right or brutally hard. It’s important to be honest – the app will adjust difficulty based on your feedback, so be accurate. You can also rate and pass judgement on entire exercise sessions. 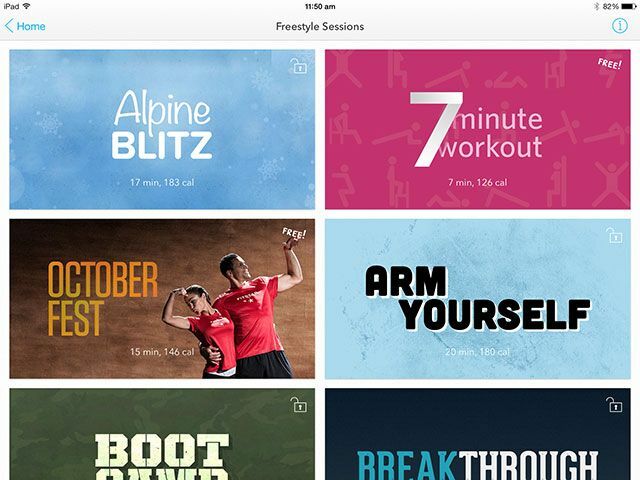 Fitstar also includes non-program workouts under the Freestyle banner. These offer a set of varied exercise sessions which you can take on at any time – from the humble seven-minute workout to exercises that focus entirely on your arms or legs. Roughly half of these are completely free, though the free option is still quite limited. Fitstar arguably works best as a premium subscription service, with a yearly subscription running $49.99 for 12 months (though I grabbed the $29.99 new year promotion, which is still running at the time of publishing). You can also elect to pay $4.99 per month, if you don’t want to commit to a whole year. Both prices compare favourably to gym subscriptions, and being able to complete a workout in my living room rather than dragging myself to a gym means I’m far more likely to continue the routine. If you’re not interested in spending at least some money on a fitness regime, Fitstar might not be for you. 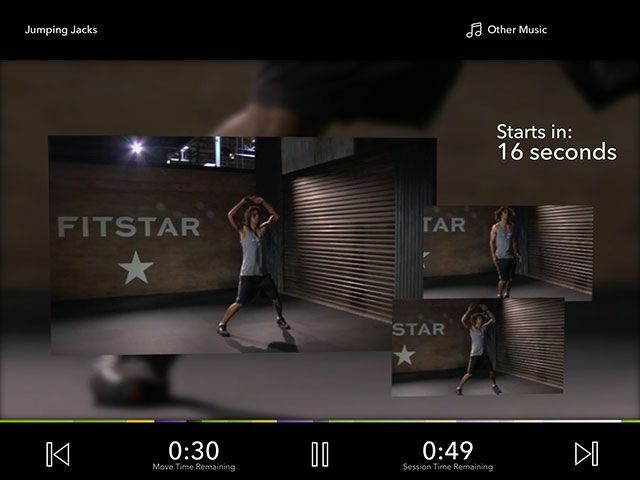 The free option consists of a total of two workouts per week, and you can choose to complete the Get Moving program (designed for those still considering a purchase) or any of the available Freestyle workouts. The problem comes when you’ve completed your two weekly workouts and want to continue – at which point you’ll need to upgrade. There are few premium services I’m happy to pay for – Rdio is one, Netflix would be another – and Fitstar has now joined that list. It might be because I snagged a year at a promotional price, but I’m sure it has more to do with the fact that a year of Fitstar costs so much less than a month at my local gym. 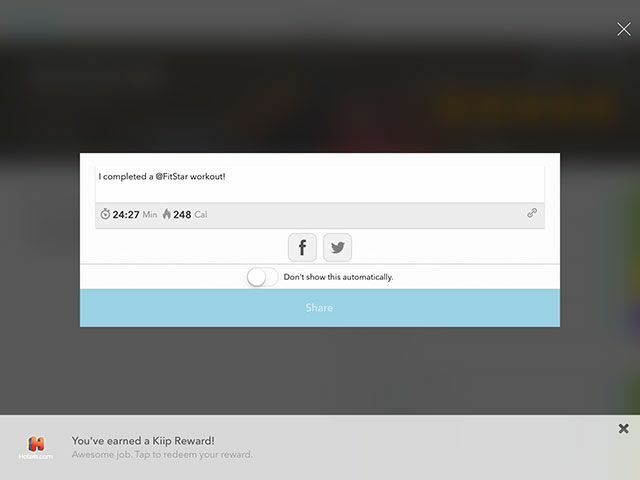 The app uses a mixture of social and gamification features to keep you motivated. The most basic feature is the humble push notification, which will sound whenever you’re due for another workout. Fitstar is clever – these notifications should correspond with the time of day you normally exercise. You’ll also receive emails with subject lines like “Today’s workout” so there’s no escape. As you embark on your Fitstar journey you’ll begin earning badges and unlocking new levels, which essentially means nothing, but if you enjoy visualising your progress then it’s a nice touch. 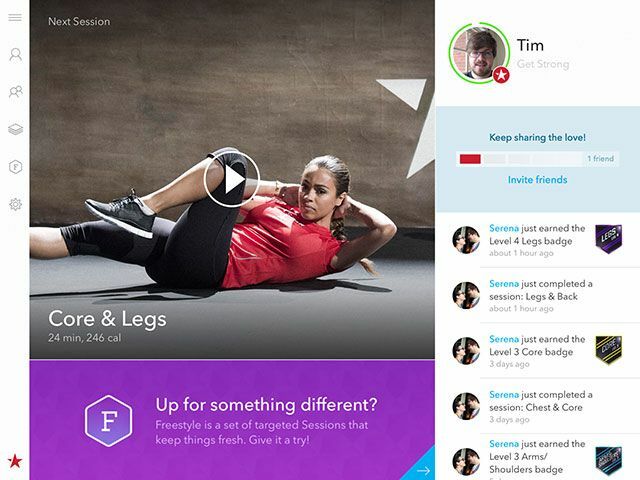 By connecting Facebook (sorry, no Twitter or Google+ yet) you can see which other friends are using Fitstar, and you’ll even get notifications when they complete workouts. 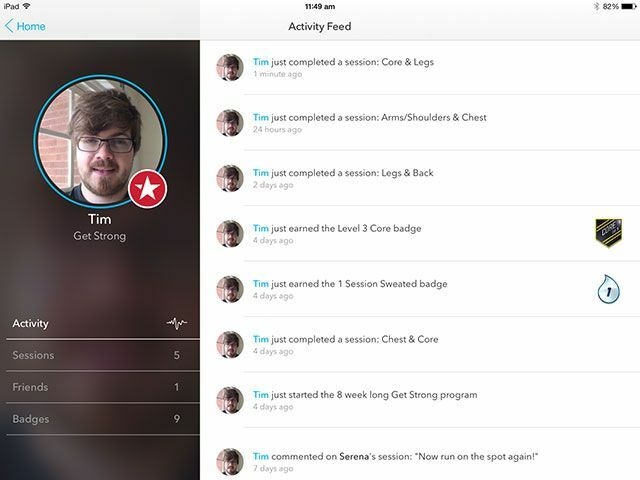 Fitstar also keeps a log of all your sessions, so you can go back, add comments and ratings as well as see how far you’ve come. If you use a personal activity monitor like the Fitbit Flex or Jawbone UP, Fitstar can connect and report accurate workout information too. I’ve not used a huge number of fitness apps, but I did spend some time trying out a few with my girlfriend before we both settled on Fitstar. That’s not to say it’s the best fitness app on the App Store, but it’s certainly the best fitness app for me. If you lament the cost and efforts involved in joining a gym, but still want to keep work on a fitness routine then Fitstar is a great choice that motivates you to workout in the confines of your office, living room or backyard. Have you tried Fitstar, or do you prefer a different exercise app? Maybe you went ahead and joined the gym? Let us know what works for you in the comments.